Hello, friends! I enjoyed our visit last week and it's hard to believe that it's time for another visit. 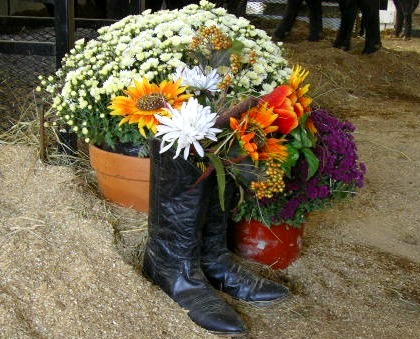 I've been busy with music lessons,a horse show, and readying our farm for some visitors soon. Wendell had a good time with his virtual carrots from last week's participants, but he said they weren't very filling!Let's get on to some good conversation. What will you have for Thanksgiving dinner? If not in the US, tell us about a special meal, please. What's the biggest vehicle you've driven? What question would you like to ask the people visiting on my porch next week? 1. I use a point and shoot that I bought for my hubby for Christmas quite a while ago. Digital cameras were just starting to appear on the market- that's how old the thing is. It goes through batteries like crazy and malfunctions periodically. 2. Turkey, stuffing, sweet potatoes, mashed potatoes, several vegetables, seafood-to be determined, rolls, fruit salad, and desserts as far as the eye can see will be our meal. I need to take a nap after listing that! 3. The box truck we have for our business is the biggest thing I've ever driven. I can't back it well, to save my life! The back covers the rear window, so you have to back only with side mirrors. I never remember to fix them to my needs before it becomes an issue. I have to back it into the bay in the barn sometimes and I have to get out to see what I need to do to get it in right (sometimes more than once). 4. I have been on commuter trains in cities and I have been on railroad trains- choo-choo! I have been on a train in the Chattanooga area called the Incline Railway. That was really different. I have also been on numerous trains in Europe when my Mom and I traveled. 5. Nuh- uh! I asked you first! Have such an interesting week that you have plenty to tell us next week! Patrice, thanks for entering my giveaway. Your email address doesn't show up in your comment so can you let me know your email in case you win! 1. What kind of camera do you use? My iPhone. Ha Ha! 2. What will you have for Thanksgiving dinner? If not in the US, tell us about a special meal, please. Turkey, mashed potatos and gravy, stuffing, rolls, green bean casserole and lots of pie! 3. What's the biggest vehicle you've driven? My current SUV. 4. Have you ever been on a train? This can be a commuter train or the chugga-chugga-choo-choo kind. :) I've been on the train at Disneyland! 5. 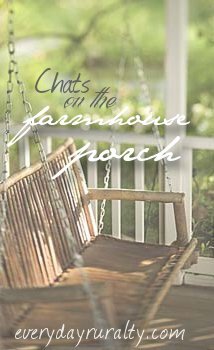 What question would you like to ask the people visiting on my porch next week? What is your favortie coffee drink? Oh, goody! Time to chat again! 1. We have three digital cameras and I usually just grab the one closest to me. I tend to use the oldest one most often, that's a Canon PowerShoot. It is pretty simple to use and I like that! 2. I'll serve up the basics for Thanksgiving, but may substitute some sort of Pumpkin yummy thing for pumpkin pie. Maybe pumpkin cheesecake or a pumpkin flan I saw on a blog. 3. How about an airplane? Does that count? I guess not since you really don't 'drive' them! I guess the biggest thing was my brother's old Suburban. It probably seemed so big 'cause I had to drive it on some narrow dirt roads with a sheer drop off on one side! 4. Trains - yup! We used to go to camp on a train. They put together one train for all of the camps in that area and each camp would have a number of cars. It was great fun! My hubby's dad was a railroad engineer, so hubby loves all things railroad. We have gone on numerous old steam-fired train rides throughout the US. 5. Hmmh... questions? How 'bout something about families, fun trips or vacations, accomplishment that makes you feel the most proud, chore you hate the most and wish a blogger would come and do for you!! I have been on the incline railway in Chattanooga. Holy moly!!! 1. nikon d3100 dslr and a nikon coolpix point & shoot. 3. probably a UHaul - UGH! 5. hmmm... too hard. too private. I always love your answers. You fix a ton of food!! I am thankful now that the girls bring food. It helps so much but like you way, way to many desserts. I will be joining in later. Now time for school!! I'm still working out my Thanksgiving menu- I want it to be gluten and sugar free. I've got everything except the stuffing figured out! I got a little carried away with my answer to number 5. Sorry! 1. I use a Nikon Cool Pix, and I love it! 2. Thanksgiving always consists of a turkey and cornbread stuffing, with the usual greenbean casserole, potatoes, etc.! And I love pecan pie! With Bill's new job...we will see what happens. 3. The biggest vehicle I have driven is a van! Bill, however, is driving rigs with 53' trailers! 4. Yes, commuter trains, Amtrak, even the old Santa Fe train when I was a kid! 5. What is the most unusual pet you have had? Thanks Patrice! I love your visits! Thanks for having me over!